Illustration © The Estate of John David Roberts. Reproduced with the permission of the William Roberts Society. Text © David Cleall, from Sotheby's London, Modern and Post-War British Art, 10 May 2012 (lot 1). The unusual presence of a printed notice of a boxing contest between Kid Lewis and Jim Berry adhered to its surface helps to identify this large and dramatic black-and-white ink drawing as being derived from a boxing subject. Boxing records identify two contests between these boxers  the first on 22 December 1912 and the second on 14 March 1914. As the drawing is consistent with the abstract work that Roberts was producing in 1914, and as Roberts was still attending the Slade in 1912 and was not creating 'abstract' works, it is probable that the drawing relates to the 1914 contest. It also seems safe to assume that this is the drawing entitled The Boxers that was exhibited in the New English Art Club in the summer of 1914 and then nine months later, as Boxers, in the second London Group show, in March 1915. This large drawing is in a finished state suitable for exhibition, despite extensive faint underdrawing, and the London Group catalogue identifies Boxers as being 'a drawing'; however, as no other details are given, and as no reproduction or study for this composition is known, it is not possible to verify this assumption. Roberts seemed to have forgotten or to have been unaware of the survival of this picture when, in Some Early Abstract and Cubist Work 1913 1920 (1957), he wrote, 'Of my abstract pictures, these reproductions are all that have survived of the paintings and drawings done during the years 191345'   just as he seemed unaware of the survival of the drawings later reproduced in 8 Cubist Designs (1969). Moreover, the drawing has remained unknown throughout the re-evaluation of Roberts's contribution to Vorticism at the key exhibitions 'Abstract Art in England 191315' (Anthony d'Offay Gallery, 1969), 'Vorticism and its Allies' (Hayward Gallery, 1974) and the recent 'The Vorticists  Manifesto for a Modern World' (Tate/Nasher Museum/Guggenheim, 201011). When exhibited at the Hamet Gallery in 1971, reproduced in The Connoisseur magazine in March 1971 and sold by Sotheby's in 1995, a double-sided study entitled The Boxers was dated as 1914. It is possible that the dating was based on an assumption that this was a study for the drawing exhibited by the NEAC, as the double-sided study is not inscribed with a date. However, lack of similarity in terms of composition and style leads me to suggest that the two works are connected only in subject matter and that the Hamet Gallery The Boxers is more likely to date from 1919. There are striking similarities between this study and the style and composition of a number of works of 1919 especially the study for The Dancers wall panel for the Hôtel de la Tour Eiffel. Boxing remained an important subject for Roberts in the years immediately after the First World War. A watercolour Sparring Partners in the Tate is dated c.1919. The Interval before Round Ten (Roberts's first major oil painting of a non-war subject in the post-war period) and the preparatory drawing for it are dated to 191920. A fine drawing entitled The Boxing Match (aka Novices) in the Whitworth Museum, Manchester, has also been dated to 1914, but stylistically seems to be early 1920s. An etching of a boxing subject, Outclassed, in the Victoria & Albert Museum and a study for it in the British Museum are dated to the mid-1920s. 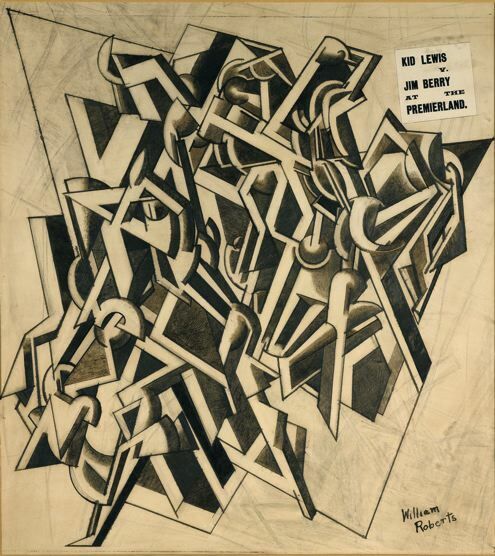 Of these boxing works, it is the recently discovered drawing that is the most abstract, and it is a work that clearly relates to the 'cubist' or abstract work that Roberts was producing between 1913 and 1915. Writing in 1957 he explained, 'I became an abstract painter through the influence of the French Cubists . . . An additional stimulant to my interest in abstract art was the example of David Bomberg a friend and fellow pupil at the Slade School who had begun to produce some fine cubist compositions.' Becoming friends at the Slade, Roberts and Bomberg shared East End working-class backgrounds and maintained a friendship throughout their lives, though they were especially close during the 191315 years. In the autumn of 1914 Roberts and Bomberg were both briefly living in the artists' commune set up by Stewart Gray in Ormonde Terrace, near Regent's Park. Philip Rylands has described Bomberg as 'the most advanced painter working in England at the time' . Bomberg had completed a number of large-scale abstract works for his one-man show at the Chenil Galleries in July 1914, including the sporting subject Ju-Jitsu (probably completed in 1913). Richard Cork comments that this work drew its inspiration from the martial arts that Bomberg saw at the gymnasium in Cable Street where his elder brother, Mo, a boxer, trained. It is surprising that Roberts submitted such a radical work as Boxers to what had become, by 1914, a rather conservative exhibiting group, the New English Art Club. However, he had had success the previous year with exhibiting The Return of Ulysses at the NEAC. Kenneth McConkey in his book on the NEAC, The New English, comments, 'The painters [William Roberts and David Bomberg] and their objectionable modernism were in evidence in the club [NEAC] as well as in the London Group, even though their work must have occasioned resentment of older members.' Boxers would presumably find a more sympathetic context when exhibited in the second London Group show in March 1915. This exhibition included Jacob Epstein's Rock Drill, Nevinson's Return to the Trenches, significant Vorticist works from Wyndham Lewis (The Crowd and Workshop) and Wadsworth's Rotterdam and Blackpool. Roberts also exhibited a major abstract painting, Boatmen (reviewed by Wyndham Lewis in Blast 2), which has been lost and is not known to have been reproduced. William Roberts, Some Early Abstract and Cubist Work 19131920 (London: Canale Publications, 1957), p. 3. Philip Rylands, 'Introduction', in The Vorticists  Manifesto for a Modern Age (London: Tate Publishing, 2011), p. 21. Richard Cork, Bomberg (London and New Haven: Yale University Press, 1988), p. 48. Kenneth McConkey, The New English (London: Royal Academy Publishing, 2006), p. 127. Roberts, Some Early Abstract and Cubist Work, p. 4. T. E. Hulme, 'Study by W. Roberts', New Age, 16 April 1914.